People have been getting tattoos for thousands of years. The reasons vary by era and culture, but today's ink popularity, as well as other body modifications, comes primarily from a desire to express individuality. 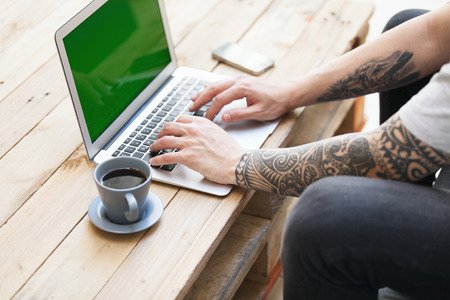 However, when visible to others, tattoos often elicit comments from people. Whether complimentary, insulting, or somewhere in between, there is something about art on skin that makes people say the darndest things! Body art and other modifications to oneself are a very personal choice. A choice you will be reminded of every day if you get a tattoo, piercing, or other procedure. It is permanent and can easily be a source of regret ten years in your future when you decide you really don't like that bouquet of red roses on your shoulder. You may also, depending on the severity and visibility of your body art, have to accept that people may be distracted by it, drawn to it, and make comments about it. You may be asked numerous questions about this choice you've made. How will you handle this? Mindfulness will be of great benefit here. It is important to understand that the majority of those making snide comments or questioning your state of mind likely do not have tattoos themselves. Therefore, they can't possibly empathize with your choice of getting one. Prejudice is everywhere, and is most blatant when you are "different" in some way. Marking yourself with permanent ink, gauging your ears, or piercing various areas of your face draws all kinds of attention. You may not get the kind of work you want and it can compromise some relationships. If you can choose to be different and still maintain the decorum of a respectable human being, then you are a better person than most people. Just know that this may be a difficult path. I had an Aha! moment when I read one response on Quora about responding to tattoo haters. One young man wrote, "tattoos seem to be one of the few things which make people forget their manners." He's right about this. It's not often that people see something and openly voice their opinion to a complete stranger. No matter your thoughts on tattoos and other body art, is it etiquette-ful to voice your opinion? Of course, you have a right to feel what you feel about it, and a right to express your thought. But should you? What will making a negative comment, asking an insulting question, or belittling someone accomplish? Most likely a tense moment, a strained relationship, or a black eye. The subject of body art can be a conversation killer because it focuses on an outward appearance of someone’s body. Depending on your point of view, speaking about this with others may reveal a prejudice that is much better left unsaid. Speaking about someone’s tattoos in the company of others could make that person self-conscious. Body art, depending on the time and place and company, is much like the taboos of politics and religion, as it is a sensitive topic. And you never know what tattoo lies underneath someone’s clothing. 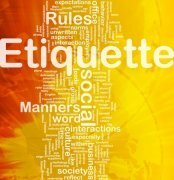 Many times, the best way to maintain civility in a situation is to simply not say anything. 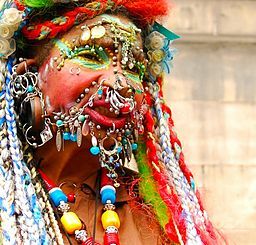 Tattoos and other physical alterations can be eye-catching - and distracting. If you're caught staring, a friendly smile may make up for it. You might also attempt a blanket compliment such as, "Nice art." But unless you know the person very well, it's best to mind your own business and not attempt to dig in to the subject. Many people have strong opinions about tattoos and easily stereotype those who have them in a negative way. But the truth is, you never know someone until you know them - tattooed or otherwise.